Haggis is a kind of savoury pudding containing sheep's 'pluck' (heart, liver and lungs), minced with onion, oatmeal, suet, spices, and salt, mixed with stock, and traditionally encased in the animal's stomach and simmered for approximately three hours. Most modern commercial haggis is prepared in a casing rather than an actual stomach. The haggis is a traditional Scottish dish, considered the national dish of Scotland as a result of Robert Burns' poem Address to a Haggis of 1787. 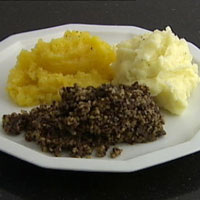 Haggis is traditionally served with "neeps and tatties" (Scots: turnip and potato, boiled and mashed separately), especially as the main course of a Burns supper. However it is also often eaten with other accompaniments. This site was created for fun due to the popularity of our Wildlife cards. Every culture has some sort of creature that they like to use to have fun with tourists, whether it be a Snipe, a Jackalope or whatever. We all like to laugh and have fun so we made this site to have fun and to honour our Scottish heritage.